Rated PG-13 for some sequences of intense action violence and frightening images. Picking up immediately where the first part left off, as the evil Lord Voldemort (Fiennes) takes possession of the powerful Elder Wand and launches an all-out attack on Hogwarts, Harry Potter (Radcliffe) and his friends must move swiftly to recover and destroy the remaining Horcruxes that make Voldemort immortal and invulnerable before the forces of darkness overrun everything they hold dear. Hard to believe now that, 15 years ago, Harry Potter existed only in the imagination of author J. K. Rowling. Strange to realize that the current generation of kids and teenagers don’t remember a world without Harry Potter and the cultural juggernaut that he became. And yet, all things must eventually come to an end, even the longest-running, most financially-successful continuous film franchise in history. * Given that status, Deathly Hallows: Part 2 has a great deal of expectation to live up to, though my own hopes for this series have remained low since every film after the third sacrificed character development and the richness of the wizarding world to focus on the action set-pieces. I have made no secret of my annoyance with the mediocrity of the second half of the Harry Potter film series, which I would classify as barely coherent “good parts” versions of the books on which they are based. Even the more exhaustive approach of the first half of Deathly Hallows felt like too little, too late, and only underscored the woeful inadequacies of the previous films. Happily, none of that baggage really seemed to matter amidst the sweeping grandeur of the final film of what suddenly feels like a far more epic saga. Trying to imagine Deathly Hallows crammed into a single film is impossible (almost as impossible as imagining the same treatment for Goblet of Fire, Order of the Phoenix, or Half-Blood Prince, but okay, I’ll let it go). The final battle is both huge and deeply personal, as familiar faces flash past, locked in mortal combat. The level of death and destruction is frightening, driving the threat palpably home, and the effects are dazzling, probably the best the series has ever offered. Best of all, the supporting characters, brought to life by perhaps the most star-studded cast of all time, finally have a chance to shine one more time before the end. In addition, splitting the story in half has allowed time for emotional revelations and plenty of significant, lingering glances (although perhaps a few too many of the latter). Here is a film that never lets us forget its portentousness. Some moments are so weighted down with the gravity of their own significance that they bring the film to a grinding halt, too, but perhaps this is an indulgence that can scarcely be avoided in the grand finale of an 8-film story arc that has been a decade in the making. Another difficulty for a film that is all climax is the anti-climactic feeling of let-down at the end. This is not so easy to dismiss. The movie builds and builds and builds to an unbearable pitch, and then drops the audience into the end credits almost entirely sans catharsis. To explain why that is, it is necessary to take a moment to discuss the film as adaptation, and to reveal some details in this paragraph and the next that could be considered spoilers, particularly to anyone who hasn’t read the book. In Rowling’s version, when Harry has his final showdown with Voldemort, they are surrounded by all of the other characters, and Harry’s victory is accompanied by a jubilant outburst that explodes off the page as everyone celebrates the end of the long months of worry, sadness, oppression, and death. In the film, there are no witnesses to the final battle between Harry and Voldemort, nor is there any indication that anyone else even knows the Dark Lord is dead when Harry re-enters the school and finds everyone calmly eating breakfast. There is an enormous sense of relief, but no feeling of joy. The film draws to a close in a mood of quiet, contemplative exhaustion, but without any of the elation that we would expect. This is a Big Deal, and I think it brings the franchise limping into port when it should have entered triumphantly under full sail, but large ships are unwieldy (almost as unwieldy as this analogy is becoming), and the filmmakers are to be commended for at least bringing this one in more or less intact. Meanwhile, I had two more quibbles with the adaptation, both of which relate to the religious undertones of the book, which I might as well air here. 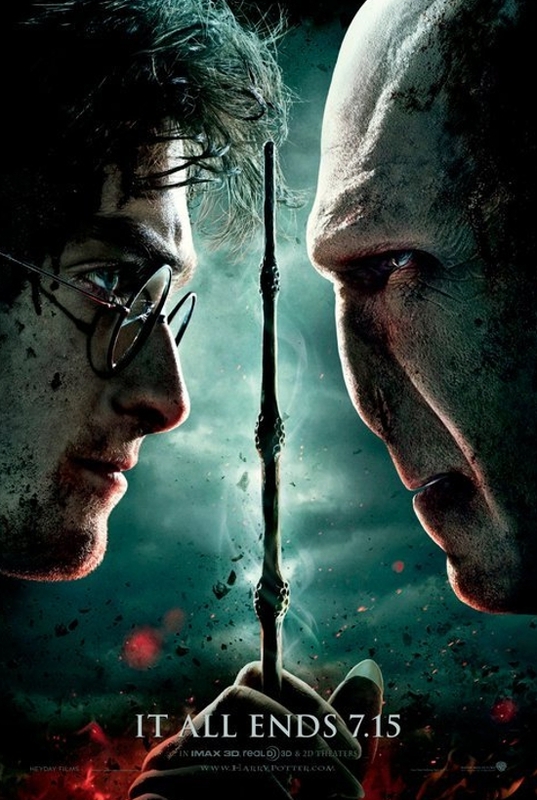 The first is that Harry does not extend a chance for redemption to Voldemort, as they do not really converse during their final duel. (Much of that dialogue is compacted and transferred to a later scene.) The second is, as near as I can tell, a new line of dialogue where Dumbledore stops and amends one of the greatest and most significant phrases in the series “Help will always be given at Hogwarts to those who ask for it” to “Help will always be given at Hogwarts to those who deserve it.” I don’t want to take up too much space here going into why I have such a problem with this change, but more importantly, I can think of no reason that explains why it was done or what it is meant to signify. These are relatively small matters. There is no doubt that this the greatest Potter film since Prisoner of Azkaban. I look forward to the chance to watch both parts of Deathly Hallows back-to-back, and I might even be convinced to rewatch the entire series in light of its successful conclusion, though I have seen the last four only once apiece and not felt the lack. Neither of the final films seems to have been meant to stand alone, and, if they can’t quite hold a candle to the pleasures of reading the series they are based on, they at least live up to the cinematic promise that such a massive undertaking has led us to expect. As adaptations of beloved stories go, it would be greedy to ask for anything more than that. *A handful of other franchises have run longer than 8 films (most notably the Bond films, with 23), but none without regularly cycling through major characters or the actors who play them. ~ by Jared on July 15, 2011. This strikes me as a fair assessment. The film didn’t leave me with a lot of specific things to complain about, but it didn’t live up to its own grand self-image, either. I thought the first half was far better; the heightening tension was on a slow simmer and seemed a lot more interesting. Perhaps the filmmakers were proceeding a bit too much as if the audience didn’t already know the ending. They were counting on a sense of release that wasn’t going to be there unless they put more into drawing us back into and through the story. Good storytellers know that uncertainty — audience anxiety — is something that has to be created, not something that exists simply because the narrator has lined up the crisis points correctly.